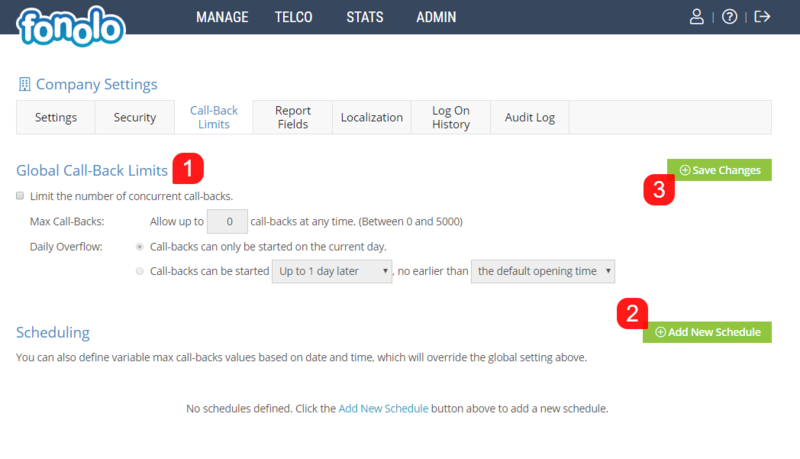 Under the Call-Back Limits tab, you are able to set a global limit for the maximum number of concurrent call-backs at any specific time. First, you have the option to set a Global Call-Back Limit (1). This is a “blanket’ type limit that limits call-backs on any day, and any time moving forward. Secondly, you have the option to set Custom Schedules (2) that will only limit the number of call-backs during certain days and times. Additionally, within each schedule, you can set a different maximum value for the number of call-backs allowed, giving you full control over when call-backs may be offered to your Clients. To add a new call-back limit schedule, click the green ‘Add New Schedule’ button in the bottom right corner of the page. When turning on Call-Back Limits, a reasonable value for the Max Call-Backs must be selected. If selecting a value that is too low, this could create a build-up of call-backs that your Agents may not be able to get to. Setting this value to zero will prevent ALL call-backs globally from being completed! To add a new Call-Back Schedule, click the green ‘Add New Schedule’ button in the bottom right corner of the page. In the pop-up, select the weekdays which you would like to limit call-backs on (1). Next adjust the time range sliders (2) to the interval that you would like the schedule to take effect in. In the ‘Max Call-Backs’ box, enter the call-back limit you would like to impose within the selected date and time range. 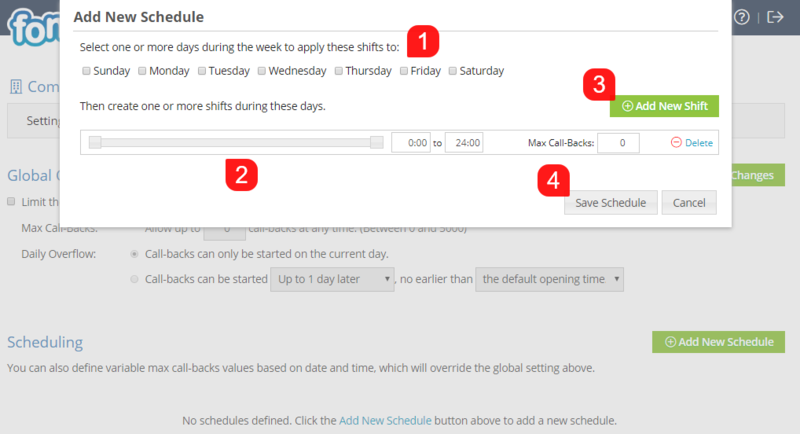 To add additional time intervals to the selected weekdays, you click the green ‘Add New Shift’ button (3) to add additional shifts to the schedule. Once all of your information has been entered, click the grey ‘Save Schedule’ button (4) at the bottom of the pop-up to go back to the previous page. This guide will explain how to set up Call-Back Limiting on specific Targets.